Five Items in my Purse Right Now. Hi, I’m Shonna Slayton, an unabashed fairy-tale fan and history buff. By combining these two loves I wrote a YA historic fairy-tale series centered on Cinderella. 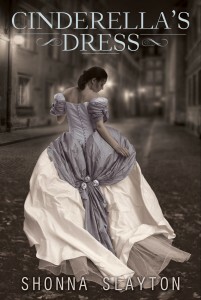 The first book, Cinderella’s Dress, is set in 1940’s New York where my main character learns her family has been hiding the real Cinderella dress for centuries, and now it is her turn. The second book, Cinderella’s Shoes, scheduled for fall release, has my main character tracking down the famous glass slippers in post WWII Europe. Besides dresses and shoes, I also love a good purse. You can learn a lot about a woman by what she has in there. Want a peek into mine? My first purse held cash and perfume samples. A few years ago, I used to carry diapers and Cheerios, but was glad to give those up in favor of Hot Wheels and stuffed animals. Now everything in my purse belongs only to me, and it’s fun to carry “author supplies” like a Sharpie pen and bookmarks. At some point in the (far, far) future I’ll probably be packing emergency baby supplies again for grand kids. My purse is a snapshot into my ever-evolving world. I don’t mind changing my purse contents a bit.